Please note: Tampereen Työväen Teatteri invited me to see their production of Cabaret for free. Let me tell you about one of the theatrical performances that has impressed me the most. Ensemble from Malmö Stadteater's and Malmö Opera's Cabaret. Photo: Markus Gårder. The musical Cabaret doesn't need much of an introduction. I'm sure every musical fan knows this show, a disturbing tale set in the 1930s Berlin, written by John Kander and Fred Ebb and celebrating its 50th birthday this year. Cabaret has been staged in many, many different ways. In the 2014 Swedish production of the musical, produced by Malmö Stadteater and Malmö Opera and directed by Hugo Hansén, we met a very brash and desperate Sally Bowles, a very young and obviously homosexual Cliff Bradshaw and a very imposing, creepy, out-of-this-world MC. The action was set simultaneously in the 1930s and in a modern day voguing house. The world portrayed onstage was fast, feverish, cruel, and very clearly on its way towards complete destruction. I wrote a short review about the production right after seeing it, but as is often the case, I didn't understand the full impact of the performance immediately. It's only when something keeps haunting you for a long time that you feel the full impact. It's been two and a half years now, but I still keep returning to the Malmö Cabaret in my memories. I saw the production because Lindy Larsson's MC intrigued me, and that's the image that comes back to me most often, too; a tall, imposing, scary yet gorgeous creature quite out of this world. But it's not just Larsson's performance that I have fond memories of. Before watching the show, I didn't know anything about vogue style dancing or ball culture – but that's a part of what made the production so interesting to me. It was a journey to not one but two unfamiliar realities. It worked on many levels: the voguing inspired choreography suited the cabaret setting well, introducing distinctly modern elements to the story made it feel more relatable and therefore way scarier, and, as a whole, the combination of historical and modern made for a very fresh and unsettling experience. It was not easy to watch, but I don't think Cabaret is meant to be. The Malmö Cabaret was by no means a perfect production (the way they finished with a two-minute-long scene of interpretive dancing meeting senseless violence left a weird aftertaste), but it was a fresh, eye-opening, fascinating one. Meine Damen und Herren, mesdames et messieurs, hyvät naiset ja herrat! The most haunting orchestration of Kickline you're ever going to hear. I had seen a disappointing production of Cabaret before watching the show in Sweden, a production that made me think Cabaret is not a musical for me at all. 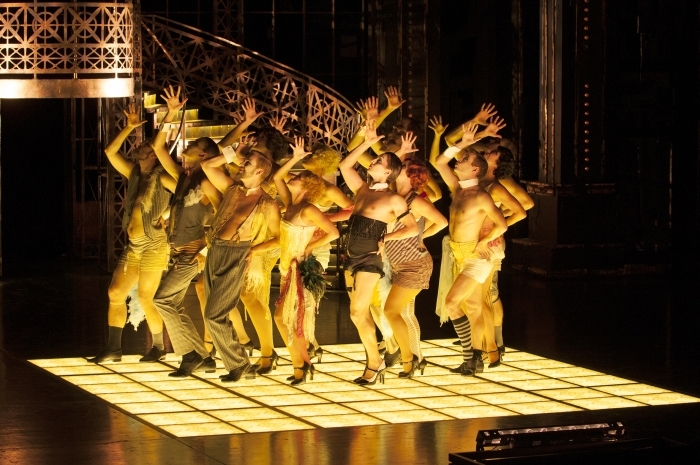 But since returning home from Malmö, Cabaret has sneakily become one of my favourite musicals. It has so many of the elements that fascinate me: a historical setting, an enigmatic narrator, strong feelings, and a very unhappy ending. I'm thinking about Cabaret today because last week, I saw a new Finnish production of the musical in Tampereen Työväen Teatteri, on one of the country's biggest stages. Ensemble from Tampereen Työväen Teatteri's Cabaret. Photo: Teppo Järvinen. The production had a fantastic cast, a great look, a good sound... In short, all the elements of a fantastic show. Still, watching the premiere, I didn't feel much. Director Tiina Puumalainen (who is, by the way, going to direct The Phantom of the Opera in Sweden's Göteborgsoperan next year) had chosen a glitz-and-glamour approach with big sets and a large ensemble of dancers in lacy pants, beautiful but rather empty on the inside. I'm not saying Cabaret can't be done well in multiple ways. It can be modernised, it can be staged as a traditional period piece, it can be done really big or with a small ensemble. In theory, I'm open for all sorts of interpretations of this classic. Yet, memories of the Swedish production coming back to me every five minutes when watching the Finnish show made me wonder... Am I being so open-minded after all, or am I letting a past favourite define what I think about new versions? Whatever the case, I'm sorry to say felt hardly anything watching the new Finnish Cabaret. Other reviewers have praised it. I'm almost sorry I cannot see what they are seeing, since it would have loved to feel really excited to about this. But I guess that's, once again, a part of the magic of live theatre. Unlike movies, you get countless interpretations of the same story. If you don't like this version or that, there might be another production coming up soon that's just right for you. And with that, onwards to the new theatrical season. I feel way more alive now that it's getting colder... and I have a new musical to look forward to every week! P.S. I wonder if it's necessary for the MC to always be played by a man. In Malmö, actress Laila Adéle understudied the role – and while Lindy Larsson's MC haunts me to this day, I would have been very excited to see her, too. The MC is often portrayed as sexually ambiguous and experimenting with gender expression, so I see no reason why people of any gender couldn't perform the role. Casting a woman as the principal MC would give the musical an interesting new twist!